Three more concerts are coming to the high-definition format next week. For over 30 years, The Pretenders have perfected a tightly crafted brand of rock ‘n’ roll, topped with the haunting, smoky vocals of Chrissie Hynde. This signature sound has earned them chart-topping success on both sides of the Atlantic, and other territories worldwide. Now available for the first time in the stunning Blu-ray format, 'Pretenders: Loose In L.A.' is a 26-song concert shot in hi-def at the Wiltern Theater in 2003. Loose In L.A. captures the band touring in support of their Loose Screw album, and includes extras (the video for “You Know Who Your Friends Are,” backstage footage and a concert montage). 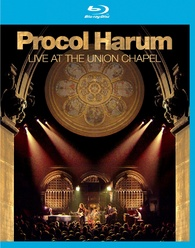 Originally released on DVD in 2004, 'Procol Harum’s Live At The Union Chapel' also includes a bonus interview with vocalist/pianist Gary Brooker, an “Earlier In The Day” montage and “Comments From The Bar” in its two and half hours. The band formed in 1967 England and had a #1 hit right out of the box with that most classic-of-classics “Whiter Shade Of Pale.” Serious musicologists for the last 44 years still haven’t figured out what its lyrics mean but that’s just added to the fascination. This song closes out a 21-track set filmed in high definition at the Union Chapel in London. Suggested list price for each Blu-ray is $19.98. You can find the latest specs for 'The Pretenders: Loose in L.A.,' ' Yes: Symphonic Live,' & 'Procol Harum’s Live At The Union Chapel' linked from our Blu-ray Release Schedule, where they're indexed under September 13.